The Dhaulagiri massif in Nepal extends 120 km (70 mi) from the Kaligandaki River west to the Bheri. This massif is bounded on the north and southwest by tributaries of the Bheri River and on the southeast by the Myagdi Khola. Dhaulagiri I is the seventh highest mountain in the world at 8,167 metres (26,795 ft) above sea level, and the highest mountain within the borders of a single country (Nepal). It was first climbed on May 13, 1960 by a Swiss/Austrian/Nepali expedition. The mountain's name is धौलागिरी (dhaulāgirī) in Nepali. This comes from Sanskrit where धवल (dhawala) means dazzling, white, beautiful and गिरि (giri) means mountain. Dhaulagiri I is also the highest point of the Gandaki river basin. Annapurna I (8,091m/26,545 ft) is 34 km. east of Dhaulagiri I. 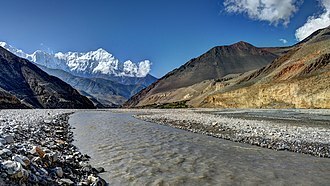 The Kali Gandaki River flows between the two in the Kaligandaki Gorge, said to be the world's deepest. The town of Pokhara is south of the Annapurnas, an important regional center and the gateway for climbers and trekkers visiting both ranges as well as a tourist destination in its own right. 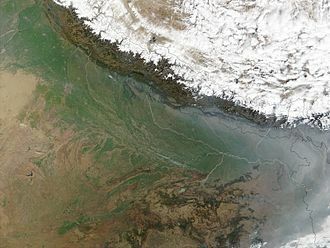 Looking north from the plains of India, most 8,000-metre peaks are obscured by nearer mountains, but in clear weather Dhaulagiri I is conspicuous from northern Bihar and as far south as Gorakhpur in Uttar Pradesh. In 1808, survey computations showed it to be the highest mountain yet surveyed. 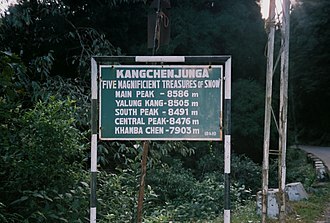 This lasted until 1838 when Kangchenjunga took its place, followed by Mount Everest in 1858. Dhaulagiri I's sudden rise from lower terrain is almost unequaled. It rises 7,000 m (22,970 ft) from the Kali Gandaki River 30 km to the southeast. The south and west faces rise precipitously over 4,000 m (13,120 ft). The south face of Gurja Himal in the same massif is also notably immense. Most ascents have followed the northeast ridge route of the first ascent, but climbs have been made from most directions. As of 2007 there had been 358 successful ascents and 58 fatalities, which is a summit to fatality rate of 16.2%. Between 1950 and 2006, 2.88% of 2,016 expedition members and staff going above base camp on Dhaulagiri I died. On all 8,000 metre peaks in Nepal the death rate was 1.63%, ranging from 0.65% on Cho Oyu to 4.04% on Annapurna I and 3.05% on Manaslu. 1950 – Dhaulagiri I reconnoitered by a French expedition led by Maurice Herzog. They do not see a feasible route and switch to Annapurna, where they make the first ascent of an 8000 m peak. 1953–1958 – Five expeditions attempt the north face, or "Pear Buttress", route. 1959 – Austrian expedition led by Fritz Moravec makes the first attempt on the northeast ridge. 1960 – Swiss-Austrian expedition led by Max Eiselin, successful ascent by Kurt Diemberger, Peter Diener, Ernst Forrer, Albin Schelbert, Nyima Dorje Sherpa, Nawang Dorje Sherpa on May 13. First Himalayan climb supported by a fixed-wing aircraft, which eventually crashed in Hidden Valley north of the mountain during takeoff and was abandoned. 1969 – American team led by Boyd Everett attempt southeast ridge; seven team members, including Everett, were killed in an avalanche. 1970 – second ascent, via the northeast ridge by a Japanese expedition led by Tokufu Ohta and Shoji Imanari. Tetsuji Kawada and Lhakpa Tenzing Sherpa reach the summit. 1973 – American team led by James Morrissey makes third ascent via the northeast ridge. Summit team: John Roskelley, Louis Reichardt, and Nawang Samden Sherpa. 1975 – Japanese team led by Takashi Amemiya attempts southwest ridge (also known as the south pillar). Six are killed in an avalanche. 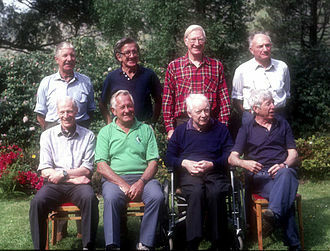 1976 – Italian expedition makes the fourth ascent. 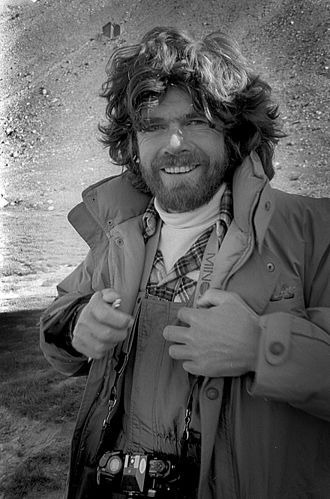 1977 – International team led by Reinhold Messner attempts the south face. 1978, spring: Amemiya returns with an expedition that puts five members on the summit via the southwest ridge—the first ascent not using the northeast ridge. One team member dies during the ascent. 1978, autumn – Seiko Tanaka of Japan leads successful climb of the very difficult southeast ridge. Four are killed during the ascent. French team attempts the southwest buttress (also called the "south buttress"), only reaches 7,200 m.
1980 – A four-man team consisting of Polish climbers Voytek Kurtyka, Ludwik Wiczyczynski, Frenchman René Ghilini and Scotsman Alex MacIntyre climb the east face, topping out at 7,500 m on the northeast ridge. After a bivouac they descend back to base camp in a storm. One week later they climb the mountain via the northeast ridge reaching the summit on May 18. 1981 – Yugoslav team reaches 7,950 m after putting up the first route on the true south face of the mountain, on the right side, connecting with the southeast ridge. They climb in alpine style but suffer four days of open bivouacs and six days without food before returning. Hironobu Kamuro of Japan reaches the summit alone, via the normal route. 1982, May 5 – Three members – Philip Cornelissen, Rudi Van Snick and Ang Rita Sherpa – of a Belgian-Nepali team reach the summit via the north-east ridge. A day later, four more climbers – Ang Jangbu Sherpa, Marnix Lefever, Lut Vivijs and Jan Vanhees – summit also. 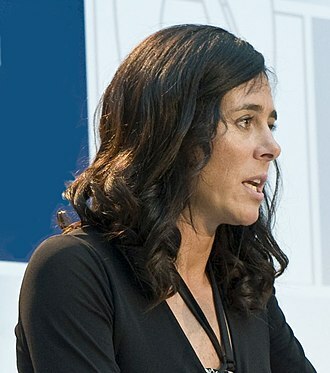 Vivijs becomes the first woman to reach the summit. 1982, 13 December – Two members (Akio Koizumi and Wangchu Shelpa) of Japanese team led by Jun Arima of the Academic Alpine Club of Hokkaido University reach the summit. By the world calendar, winter begins December 21, so this was not a winter but a very-late-autumn-climb. However the climb was done under a winter climbing permit, which the Nepali government issues for climbs beginning on or after December 1. 1984 – Three members of the Czechoslovakian expedition (Jan Simon, Karel Jakes, Jaromir Stejskal) climb the west face to the summit. Simon died during the descent. 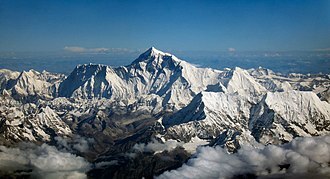 1985 – Polish expedition led by Adam Bilczewski set out to conquer Dhaulagiri for the first time in winter. After seven weeks of dramatic struggle against hurricane-force winds and temperatures below −40c°, Andrzej Czok and Jerzy Kukuczka successfully made first winter ascent on 21 January. 1986 – A mostly Polish expedition puts up a second south face route, on the left side of the face connecting with the southwest ridge route. They go above 7,500 m but do not reach the summit. 1988 – Soviet mountaineers Yuri Moiseev and Kazbek Valiev, in cooperation with Zoltan Demján of Czechoslovakia, succeed in climbing the southwest buttress. This 3,000-metre ascent, with difficult technical climbing at 6,800–7,300 m, was acknowledged as the year's best achievement at the UIAA Expedition Commission Conference. 1993 – Russian-British team puts up the direct north face route. 1995 — Anatoli Boukreev, speed ascent, record time 17 hours 15 mins, base camp to summit. 1998 – French climber Chantal Mauduit and Sherpa Ang Tshering die when an avalanche strikes their tent on the Northeast Ridge. On May 1 the Greek climber Nikolaos Papandreou is killed falling in a gorge. On October 2, the Greek Babis Tsoupras reaches the summit but does not return. The bodies of the Greek climbers were not found. 1999 – On October 24, British climber Ginette Harrison dies in an avalanche on Dhaulagiri. Days later, Slovenian Tomaž Humar climbs the south face solo but does not reach the summit. His ascent ended at 7,300 m due to a 300 m band of rotten rock. 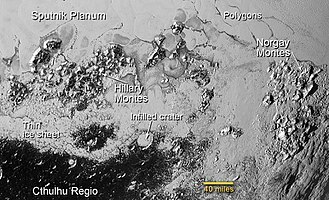 Humar traverses to the dangerous southeast ridge, re-enters the face briefly and exits at 8000 m for a descent on the northeast ridge. Dhaulagiri's south face is still unclimbed, making it one of the greatest remaining challenges in alpinism. † Only peaks above 7,200 m with more than 500 m (1,640.4 ft) of topographic prominence are ranked. ‡ The status of Churen Himal's three peaks is unclear and sources differ on their heights. The coordinates, heights and prominence values above are derived from the Finnmap. The first ascent data is from Neate, but it is unclear if the first ascent of Churen Himal East was actually an ascent of the highest of the three peaks, as Neate lists Churen Himal Central as a 7,320 m subpeak of Churen Himal East. Most of the named 7,000 metre peaks are on a ridge extending WNW, separated from Dhaulagiri I by 5,355m French Pass at 28°46'55"N, 83°31'54"E. In order they are Dhaulagiri II, III, V, IV, Junction Peak, Churens East, Central and West, Putha Hiunchuli and Hiunchuli Patan. False Junction Peak, Dhaulagiri VI and Gurja are on a ridge extending south from Junction Peak. The British Alpine Club's Himalayan Index lists 37 more peaks over 6,000 m.
6,182m Pota Himal (FinnMap sheet 2883-01 "Chhedhul Gumba") stands north of the main ridge between Churen and Putha Hiunchuli. Pota has been informally renamed Peak Hawley after Elizabeth Hawley, a notable expedition chronicler and Kathmandu-based reporter. Hiunchuli Patan at the western end nearest the Bheri River is locally called Sisne or Murkatta Himal. It was an iconic landmark to insurgents based in Rukum and Rolpa districts during the 1996–2006 Nepal Civil War. 1954 – J. O. M. Roberts and Ang Nyima Sherpa climb Putha Hiunchuli, first major summit ascent in the range. Pre-monsoon and post-monsoon reconnaissances of Dh.II by Japanese expeditions. Hangde 6556m in Mukut section attempted. Churen attempt from north by Japanese Nihon University expedition. Climbed Hangde (~6600m), Tongu (~6250m), P6265 during approach/acclimation through Hidden Valley; also Kantokal (~6500m) north of Putha Hiunchili. Churen and Dh.VI attempt from south by J. O. M. Roberts, thinking he was on Dh.IV due to inaccurate maps. Climbed a lower peak (6,529m) near Gurja, naming it Ghustang after the stream draining the cirque they climbed in. Japanese expedition to Dh.II delayed two months by heavy snow in approach passes. Lost two porters to avalanche, then another porter was injured in a fall and needed evacuation. This left too little food to continue. J. O. M. Roberts leads British R.A.F. expedition to Dh.VI, still believing it was Dh.IV. Defeated by late monsoon, then early winter storms creating excessive avalanche risk. Dh.IV attempt by Austrian Alpine Club. Five Austrians and one Nepali disappear, may have summited. Gurja climbed by Japanese expedition. First authorized ascents of Tukuche 6920m and Tukuche West 6800m. Japan's Kansai Mountaineering Club unsuccessful on Dh.IV in April but climbed Dh.VI and False Junction Peak. 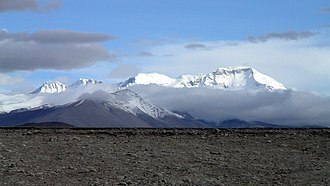 Korean expedition claims they summited Churen East on April 29. Questioned by same year Japanese expedition, see next. Japanese expedition climbs Churen Central and Churen West on October 24. First ascent of Dh.II on May 18 by German expedition. Dh.V attempted by pre- and post-monsoon Japanese expeditions. Both ended by fatal accidents. 1972 – Dh.IV attempted twice by Japanese expeditions. First attempt abandoned when a climber fell ill and died at 6200m. Second expedition climbed via crest from west, found route too long at high elevation (7,000m+). Climbed Dh.VI and Junction Peak. first ascent of Dh.III on October 20 by German expedition. Dh.IV attempted by Austrians who reached 7250m on N face, then by British who quit after two deaths. Dh.IV attempt by British R.A.F. 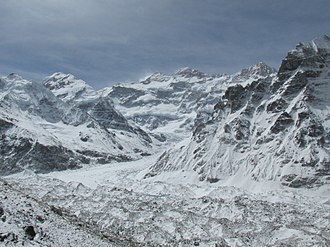 expedition abandoned after three Sherpas killed by falling ice. Dh.IV climbed May 9 by S. Kawazu and E. Yusuda, who died on descent, bringing death toll on Dh.IV to 14. 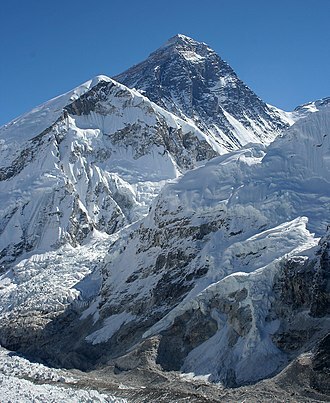 (Compared with 13 deaths on Mount Everest before it was successfully climbed in 1953.) Another Japanese expedition in October puts ten on summit without loss of life. Dh.V climbed by M. Morioka and Pembu Tsering Sherpa on Japanese expedition. 1979 – Japanese traverse Dh.II, III and V along 7,150m+ crest. Expedition led by a woman. 2008 – First ascent of Peak Hawley (AKA Pota Himal; named after Elizabeth Hawley). Solo climb by François Damilano following expedition climb of Putha Hiunchuli. 2013 – First ascent of Hiunchuli Patan (known locally as Sisne or Murkatta Himal). 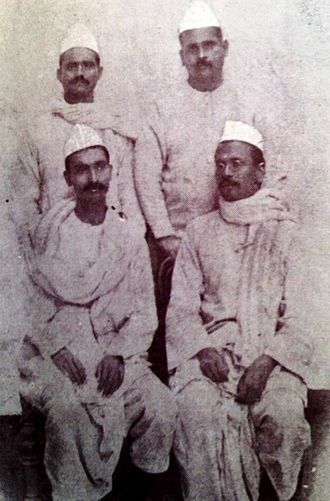 Nepalese expedition led by Man Bahadur Khatri. Monier-Williams, Monier (1964) . A Sanskrit-English Dictionary. Oxford University Press. Retrieved 20 April 2011. Waller, Derek John (2004). The Pundits: British Exploration of Tibet & Central Asia. Lexington, KY, USA: University Press of Kentucky. ISBN 0-8131-9100-9. Retrieved 4 January 2014. Isserman, Maurice; Weaver, Stewart (2010). Fallen Giants: A History of Himalayan Mountaineering from the Age of Empire to the Age of Extremes. Yale University Press. ISBN 978-0300164206. Retrieved 19 October 2014. 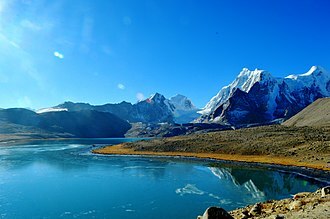 ^ "High Asia – All mountains and main peaks above 6750 m". 8000ers.com. Retrieved 2014-08-28. ^ "Dhaulāgiri, Nepal". Peakbagger.com. Retrieved 2011-04-26. ^ "Valmiki National Park, Bihar". indiamike.com. Retrieved 2011-04-21. ^ "Dhaulagiri I". 8000ers.com. Retrieved 4 January 2014. ^ Salisbury, Richard; Hawley, Elizabeth (September 2007). "The Himalaya by the Numbers, a statistical analysis of mountaineering in the Nepal Himalaya" (PDF). Retrieved April 25, 2011. ^ Dangar, D.F.O (1984). "A Record of the First Ascents of the Fifty Highest Mountains" (PDF). Alpine Journal. Alpine Club. 89: 184–7. Retrieved April 24, 2011. ^ "American Dhaulagiri Expedition—1969". American Alpine Journal. American Alpine Club. 17 (1): 19. 1970. Retrieved 2016-10-28. ^ American Alpine Journal, 1971, p. 438. ^ Reichardt, Louis F. (1974). "Dhaulagiri 1973". American Alpine Journal. American Alpine Club. 19 (1): 1. Retrieved 2016-10-28. ^ Cicogna, Antonella (2000). "The South Face of Dhaulagiri". American Alpine Journal. American Alpine Club. 42 (74): 13. Retrieved 2016-10-28. ^ MacIntyre, Alex (1981). "Dhaulagiri's East Face" (PDF). American Alpine Journal: 45–50. ^ Dhaulagiri I, himilayanpeaks.wordpress.com, accessed 2Aug2016. ^ "Everest - Mount Everest by climbers, news". www.mounteverest.net. Archived from the original on 7 August 2016. Retrieved 2 April 2018. ^ "DHAULAGIRI 1984-85 : Himalayan Journal vol.43/6". 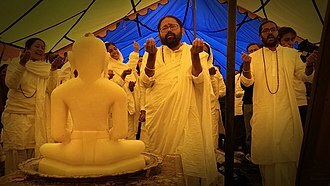 www.himalayanclub.org. Retrieved 2 April 2018. ^ "Dhaulagiri I". wordpress.com. 6 July 2012. Retrieved 2 April 2018. ^ "Anatoli Boukreev". Mountaineering and Climbing Federation of Republic of Kazakhstan. Mountain.kz. Retrieved 7 April 2019. ^ Νταουλαγκίρι (Dhaulagiri). Article in Greek Wikipedia in Greek language. ^ "Ginette Harrison". The Guardian. October 28, 1999. Retrieved 2016-10-28. ^ a b Neate "High Asia"
^ Carter, H. Adams (1985). 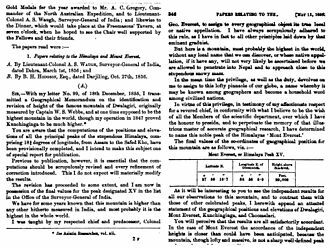 "Classification of the Himalaya" (PDF). American Alpine Journal. American Alpine Club. 27 (59): 109–141. Retrieved April 29, 2011. ^ "Terrain Map". Wikimapia. Retrieved April 21, 2011. ^ Roberts, J.O.M. ; Cheney, M.J. (1971). "Climbs and Regional Notes: Asia, Nepal" (PDF). Alpine Journal. London: Alpine Club. 76: 228. Archived from the original on 2011-09-03. Retrieved April 21, 2011. ^ "The Alpine Club". Retrieved April 21, 2011. ^ "Himalayan Index". U.K. Alpine Club. Retrieved April 21, 2011. ^ Roberts, J.O.M (1956) . "Round about Dhaulagiri". Himalayan Journal. New Dehli: Himalayan Club. 19. Retrieved April 21, 2011. ^ Eidher, Egbert (1964). "The 1963 Austran Dhaula Himal expedition". Himalayan Journal. New Dehli: Himalayan Club. 25. Retrieved April 21, 2011. ^ Kato, Kiichiro (1960). 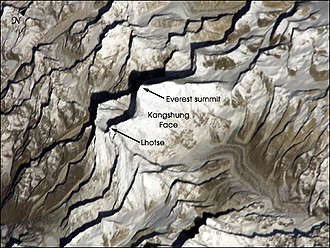 "Reconnaissance around Dhaulagiri II" (PDF). American Alpine Journal. American Alpine Club. 12 (34): 67–72. Retrieved April 21, 2011. ^ Humphreys, John S. (1961). "North of Dhaulagiri" (PDF). American Alpine Journal. American Alpine Club. 12 (35): 249–62. Retrieved April 21, 2011. ^ Shojiro Ishizaka (1963). "Mukut Himal and Churen Himal" (PDF). American Alpine Journal. American Alpine Club. 13 (37): 520–1. Retrieved April 21, 2011. ^ J. O. M. Roberts (1966). "Expeditions and Notes, a note on the Dhaula Himal of central Nepal". Himalayan Journal. New Dehli: Himalayan Club. 27. Retrieved April 21, 2011. ^ "Egbert Eidher, 1964 op. cit.". ^ Hiroshi Sugita (1966). "Dhaulagiri II". Himalayan Journal. New Dehli: Himalayan Club. 27. Retrieved April 21, 2011. ^ J.O.M. Roberts (1966). "With the Royal Air Force on Dhaulagiri IV". Himalayan Journal. New Dehli: Himalayan Club. 27. Retrieved April 21, 2011. ^ Roberts, J.O.M. (1970). "Climbs and Regional Notes" (PDF). Alpine Journal. London: Alpine Club. 75: 196–8. Retrieved April 21, 2011. ^ Yoshimi Yakushi (1970). "Gurja Himal: first ascent, 1969" (PDF). Alpine Journal. London: Alpine Club. 75: 17–24. Retrieved April 21, 2011. ^ "Climbs and Expeditions, Nepal" (PDF). American Alpine Journal. American Alpine Club. 17 (44): 181–2. 1970. Retrieved April 21, 2011. ^ D.F.O. Dangar (1979). "The highest mountains 1968–77" (PDF). Alpine Journal. London: Alpine Club. 84: 29. Retrieved April 21, 2011. ^ Roberts, J. O. M.; Cheney, M. J. (1971). "Climbs and Regional Notes – Nepal" (PDF). Alpine Journal. London: Alpine Club. 76: 229. Retrieved April 21, 2011. ^ Yamamoto, Ryozo (1972). "First ascent of Churen Himal" (PDF). Alpine Journal. London: Alpine Club. 77: 105–9. Retrieved April 21, 2011. ^ Huber, Franz (1972). "Dhaulagiri 2" (PDF). Alpine Journal. London: Alpine Club. 77: 168–9. Retrieved April 21, 2011. ^ Roberts, J. O. M.; Cheney, M. J. (1972). "Notes 1971 (Asia, Nepal)" (PDF). Alpine Journal. London: Alpine Club. 78: 248–9. Archived from the original on September 3, 2011. Retrieved April 21, 2011. ^ Lawford, Robert (1973). "Notes 1972 Asia" (PDF). Alpine Journal. London: Alpine Club. 78: 241. Retrieved April 21, 2011. ^ Schreckenbach, Klaus; Gizycki, Peter von (1974). "Dhaulagiri III" (PDF). Alpine Journal. London: Alpine Club. 79: 198–201. Retrieved April 21, 2011. ^ Robert Lawford (1974). "Notes 1973 Asia" (PDF). Alpine Journal. London: Alpine Club. 79: 255. Retrieved April 21, 2011. ^ Edward Pyatt (1975). "Notes 1974 Asia" (PDF). Alpine Journal. London: Alpine Club. 80: 264. Retrieved April 21, 2011. ^ Nishamae, Shiro. "First ascent and tragedy on Dhaulagiri IV, 1975". Himalayan Journal. New Dehli: Himalayan Club. 34. Retrieved April 21, 2011. ^ Connor, T.M. (1976). "Regional Notes 1975" (PDF). Alpine Journal. London: Alpine Club. 81: 242. Retrieved April 21, 2011. ^ Michiko Takahashi (1980). "Dhaulagiri II, III and V Traverse" (PDF). American Alpine Journal. American Alpine Club. 22 (54): 630–1. Retrieved April 21, 2011. ^ Dougal MacDonald (10 July 2008). "Newly Climbed Peak Named for Elizabeth Hawley". Climbing (magazine). Retrieved 14 March 2019. The French ice climber François Damilano has named a newly climbed peak in Nepal after Elizabeth Hawley, the longtime chronicler of mountaineering in the Himalaya. Damilano made a solo first ascent of Peak Hawley (6,182 meters) in the Dhaulagiri Group in early May. ^ Damilano, François (2009). "Asia, Nepal, Dhaulagiri Himal, Peak Hawley (6,182m)". American Alpine Journal. American Alpine Club. 51 (83): 321. Retrieved April 24, 2014. ^ "Mt Sisne scaled for first time". The Himalayan Times. Kathmandu. May 28, 2013. Retrieved Jan 4, 2014. Manaslu is the eighth highest mountain in the world at 8,163 metres above sea level. It is located in the Mansiri Himal, part of the Nepalese Himalayas and its name, which means mountain of the spirit, comes from the Sanskrit word manasa, meaning intellect or soul. Manaslu was first climbed on May 9,1956 by Toshio Imanishi and Gyalzen Norbu and it is said that just as the British consider Everest their mountain, Manaslu has always been a Japanese mountain. Manaslu is the highest peak in the Gorkha District and is located about 64 km east of Annapurna, the Manaslu region offers a variety of trekking options. The popular Manaslu trekking route of 177 kilometres, skirts the Manaslu massif over the pass down to Annapurna, the Nepalese Government only permitted trekking of this circuit in 1991. The trekking trail follows an ancient salt-trading route along the Burhi Gandak River, en route,10 peaks over 6,500 metres are visible, including a few over 7,000 metres. The highest point reached along the route is the Larkya La at an elevation of 5,106 metres. As of May 2008, the mountain has been climbed 297 times with 53 fatalities, the Manaslu Conservation Area has been established with the primary objective of achieving conservation and sustainable management of the delimited area, which includes Manaslu. Set in the northern Himalayan range in the Gorkha District of Nepal, Manaslu is a wall of snow. The three sides of the fall in steps to terraces down below, which are sparsely inhabited with agricultural operations practiced on the land. Apart from climbing Manaslu, trekking is popular in mountain region, as part of the Manaslu Circuit. The Manaslu Conservation Area, declared as such in December 1998 under the National Parks and Wild Life Conservation Act, the area covered under the conservation zone is 1,663 square kilometres and is managed by the National Trust for Nature Conservation of Nepal. The trekking route is through mountainous terrain prone to the consequences of monsoon rainfall, land slides, encounters with passing yaks, and hypothermia and altitude sickness, are common. Anatoli Nikolaevich Boukreev was a Russian Kazakhstani mountaineer who made ascents of 10 of the 14 eight-thousander peaks, i. e. peaks above 8,000 m, without supplemental oxygen. From 1989 through 1997, he made 18 successful ascents of peaks above 8000 m, in 1997, Boukreev was killed in an avalanche during a winter ascent of Annapurna in Nepal. Boukreevs companion, Linda Wylie, edited his memoirs and published them in 2002 under the title, Above the Clouds, Boukreev was born in Korkino, within the Russian SFSR Soviet Union. He came from the narod, the people, and his parents were both poor. After completing high school in 1975, he attended Chelyabinsk University for Pedagogy, at the same time, he completed a coaching program for cross-country skiing. After graduation, the 21-year-old dreamed of mountain climbing, Boukreev moved to Alma-Ata, the capital of the neighbouring Kazakh SSR located in the Tian Shan mountain range. From 1985 he was part of a Kazakhstani mountaineering team, Boukreev worked as a commercial guide in the 1990s, and was working with Scott Fischers adventure company Mountain Madness during the 1996 Mount Everest disaster. He managed to survive and was instrumental in saving the lives of others. 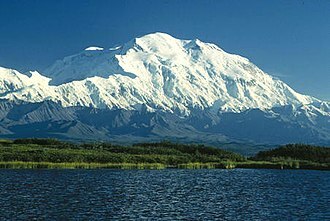 Denali, previously known as Mount McKinley, has such as hidden crevasses and unpredictably cold weather due to its proximity to the Arctic Circle. The expedition was a success and the reached the summit. During the climb there had been somewhat of a language barrier, after the team had returned home, Boukreev decided to attempt a solo speed ascent of Denali before returning to the Soviet Union. Boukreevs solo speed ascent of Denali in 1990 was completed in 10½ hours from the base to the summit, in 1993, Boukreev reached the summit of K2 via the Abruzzi Spur, where he shared the peak with team members Peter Metzger of Germany and Andy Locke of Australia. 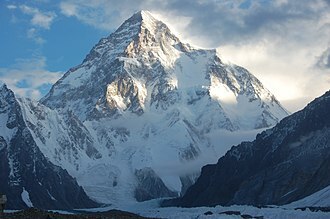 The other team members were German climbers Reinmar Joswig and Ernst Eberhardt, with a peak elevation of 8,611 metres, K2 is the second-highest mountain on Earth after Mount Everest. As part of the Karakoram range, K2 is located on the border between Pakistan and China, K2 is referred to as the Savage Mountain — notable for its steep pyramidal relief, dropping quickly in almost all directions, and the inherent danger in climbing it. The eight-thousanders are the 14 independent mountains on Earth that are more than 8,000 metres high above sea level. All eight-thousanders are located in the Himalayan and Karakoram mountain ranges in Asia and their summits are in the death zone. The first recorded attempt on an eight-thousander was when Albert F. Mummery, the attempt was unsuccessful when Mummery and two Gurkhas and Goman Singh, were killed by an avalanche. The first recorded ascent of an eight-thousander was by the French Maurice Herzog and Louis Lachenal. 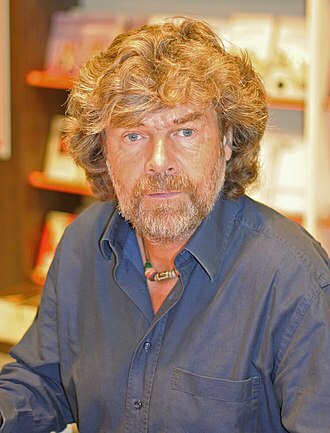 The first person to climb all 14 eight-thousanders was the Italian Reinhold Messner, in 1987, Polish climber Jerzy Kukuczka became the second person to accomplish this feat. Messner summitted each of the 14 peaks without the aid of supplemental oxygen and this feat was not repeated until nine years by the Swiss Erhard Loretan in 1995. Phurba Tashi of Nepal has completed the most climbs of the eight-thousanders, juanito Oiarzabal has completed the second most, with a total of 25 ascents between 1985 and 2011. Jerzy Kukuczka was a Polish alpine and high-altitude climber. Born in Katowice, his origin is Goral. On 18 September 1987, he became the man, to climb all fourteen eight-thousanders in the world. He is the person in the world who has climbed two eight-thousanders in one winter, and four eight-thousanders in winter altogether, including three in winter for the first time. Along with Tadeusz Piotrowski, Kukuczka established a new route on K2 in alpine style, Kukuczka is widely considered among the climbing community to be one of the best high-altitude climbers in history. During his career, Kukuczka established ten new routes and climbed four summits in winter and he was one of an elite group of Polish Himalayan mountaineers who specialized in winter ascents. He climbed all summits, except for Mount Everest, without the use of supplemental oxygen, above 8000 at Everest benefited from the support of the oxygen cylinder, because in 1980 they did not know yet the exact impact of prolonged hypoxia to the brain. 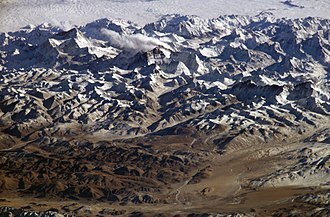 Annapurna's "Sickle" (centre). Shoulder of Tilicho Peak (right) obscures lower parts of Annapurna.